Names of national and provincial assembly members elected from district Gujrat in elections 2013 are shown below. 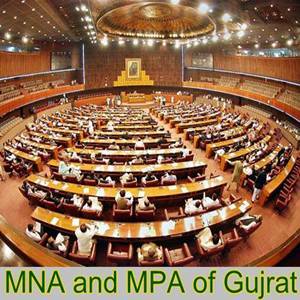 Elections was held on 4 national and 8 provincial assembly seats of district Gujrat, Pakistan. Candidates of various parties and independent candidates contested. Pakistan Muslim League (N) won 3 seats of MNA and 7 seats of MPA while Pakistan Muslim League (Q) won 1 seat of MNA and 1 seat of MPA. Pakistan Peoples Party, Pakistan Tehreek-e-Insaf, Jamaat-e-Islami or any other political party and independent candidates could not win any seat from any constituency of district Gujrat. District Gujrat has 3192 square KM area and 2.048 million population. There are 1.571 million registered voters (0.879 million male, 0.692 female). Following results of elected MNAs and MPAs are unofficial and undeclared, Final results will be announced by Election Commission of Pakistan.